Crystocraft Swarovski Crystal Christening Cross Silver Ring. Crystocraft - 'Christening Cross' Each piece of Crystocraft is made using a combination of metal craftsmanship and Strass Swarovski Crystals. The 'Christening Cross' made and designed by 'Crystocraft'. A beautiful keepsake special gift for a anyone celebrating a Christening. 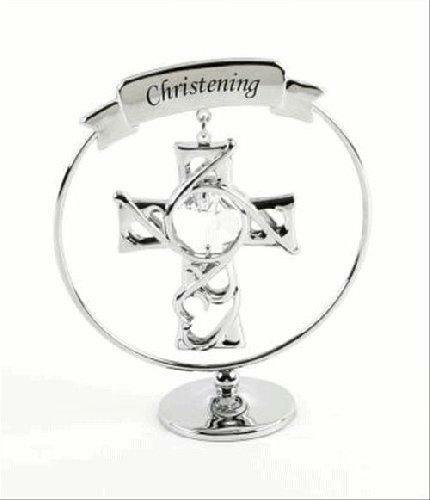 The chrome cross has a plaque with the words 'Christening' and a Strass Swarovski crystals within the centre. 'Crystocraft' pride themselves in a promising brand with exceptional taste, style and beauty. Beautiful craftsmanship and Strass Swarovski Crystal. Comes complete in a 'Crystocraft' gift box.